Created to be an invaluable resource for school leaders in Australian Non-Government Schools, this carefully-researched white paper focuses on 12 issues and risks that are likely to impact a school’s ability to achieve its strategic objectives in 2019. This paper includes resources to help school leaders and boards manage those risks. Provide a list of carefully-worded strategic risks to consider in addressing each issue/risk, that could form the basis of a school’s strategic risk register. The white paper deliberately steers school leadership and boards to think strategically and consider the strategic risks associated with the issues that are raised. Why Exclusive to School Governance Subscribers? Throughout the year, we will use School Governance subscription as the vehicle for publishing articles and announcing webinars linked to this white paper. We will also provide updates to the white paper in the future. School Governance is the Australian school sector’s leading news and information source on issues related to governance, risk management, compliance and policy management. It’s a weekly newsletter and searchable reference site dedicated to providing unbiased news that relates to the management of schools. Articles are written by the CompliSpace Editorial team and guest authors from the Australian school sector. 75% of School Governance subscribers read it WEEKLY! School Governance subscribers get access to SG Subscriber Exclusive content, like this white paper. This white paper was written by members of the Education Consulting team and the Editorial team at CompliSpace. CompliSpace conducted a thorough review of published risk reports from across the country as well as a detailed review of the most-reported risks in the education sector in the period July 2018 to February 2019. Every day, CompliSpace monitors the progress of over 9,000 pieces of legislation. We also engage directly with school boards to gather anecdotal evidence first hand. 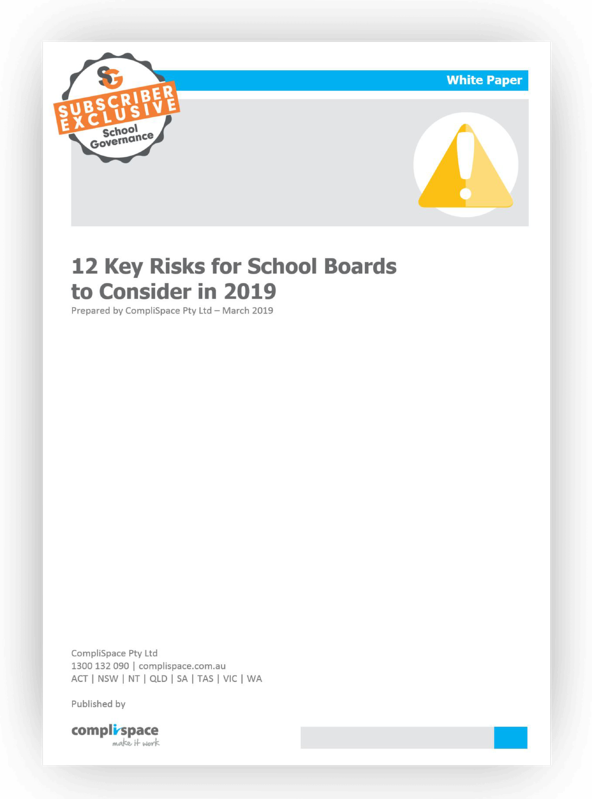 Based on this research and our review of media articles, industry reports and our partnership with over 600 schools around Australia, CompliSpace have compiled this list of 12 Key Risk Areas that we believe Non-Government School Boards should consider in 2019. Craig is the National Education Lead at CompliSpace. 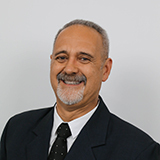 He began his education career in 1983 and has taught in a number of non-government schools including Catholic, PSA, Anglican and Greek Orthodox schools. He spent 22 years as a Deputy Principal and Principal and five years as the Industrial Officer at the Association of Independent Schools of WA. Craig was also a Board member and Deputy Chair of a large Uniting Church School for nine years. He has a background in school leadership and governance, a demonstrated history of working in the management consulting industry - skilled in non-profit organisations, coaching, policy development, registration and compliance, curriculum development and HR/Industrial matters. Jonathan is a CompliSpace school risk and compliance specialist and regularly presents to school boards and executive staff on governance, risk and compliance issues. He also presents at school law seminars on a range of risk and compliance related topics. James is the CEO and cofounder of CompliSpace. 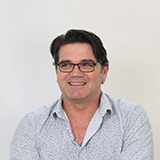 He is a highly experienced legal and corporate governance practitioner, with over 25 years’ experience in the design and implementation of enterprise risk management programs across a wide range of industry sectors. Prior to founding CompliSpace James held senior executive positions in a range of publicly listed and private companies and applies his hands-on executive experiences to assist CompliSpace clients to develop governance solutions that work and last. James is a qualified legal practitioner. 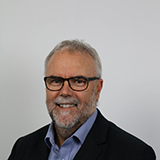 He is a member of the Australian New Zealand Education Law Association (ANZELA), as well as being a Fellow of the Governance Institute of Australia. Why is subscription required? Because we will use School Governance subscriptions to send future articles and webinars linked to this white paper, as well as updates to this white paper content.